bodrock wrote: I can't wait to see final pics for PotP Primal! He's definitely on my buy list. Generations Drift looks so cool in his good-guy colors. I almost picked him up complete/loose for twentysomething the other day...but decided my SG incarnation was enough. I'm trying to limit purchases too, but not selling any just yet. I'm also oddly curious about the PotP Primal. Agreed! I had TM1 and returned it. Picked up TM2 and love it. Missed the non TM version altogether and haven't picked it up otherwise, why would I when I have TM2 Optimal?! @Bodrock, I still want to have the Deadlock version. It's gone up since I last checked though, which makes me sads. @Cary, I think we all need that OS KO. Bummer it doesn't store the large sword though. That OS KO Drift looks SUH-WEET! I do love dem OS....I'm tempted to get that OS Megatron from WeiJiang....but may just go with MP Megz 2.0 instead. @bodrock: I need the KO MP Megatron and I wouldn't mind a 3rd party version of Deadlock. I know MMC is releasing one, but I'm not sure if it hits the right spot for me. Got some bots for Christmas!! Need to complete the "'87 seeker trio" (as carytheone calls them) as soon as I can now!! And Overlord. Totes need Overlord. Slugslinger certainly was an awesome Christmas present, along with the Clone 2-pack from Walgreens!! I would've loved MMC's Overlord but the TR version ain't bad. bodrock wrote: I would've loved MMC's Overlord but the TR version ain't bad. Thanks Cram! I'll check that KO out. $200+ is a lot to spend, even on a Masterpiece....$99 sounds good. You will definitely want to pick-up Misfire to complete the "87 seeker trio"! He's my favorite overall, but the other two are great, and may be more photogenic than he is. bodrock wrote: Thanks Cram! I'll check that KO out. Just on sale for the week I guess?! Regardless, worth it!! Misfire is inbound!! Should be here tomorrow. Paid a few extra bucks on Amazon but thanks to the giftcard it was freeeeeeeeeee for me! As for today's project, Reprolabels finally delivered yesterday!! Here's how he looks before.. Here's what's left!! I decided "no" on the city stickers and also not to do the taillights. They are painted, no reason to cover them up! I think that emblem sorta top center is "SOHC" for the single over-head cam layout of the straight 6 in the 280ZX but I could be wrong. Generations Drift! Hopefully. It's more involved. Ah so Dynastron is the KO Megs to get then? Good to know as there seems to be an itchy rash of them right now. Eventually I'll have the ultimate MP scaled Megatron, but for now a repro'd up leader Megatron will have to do. MP Prowl is looking NICE! Can't wait to see Drift done up as well. Dat KO Megz is definitely a beaut. carytheone wrote: Totes need TR OverLorde. I agree, to both statements. Waiting for that awesome sale again though!! 4th string in the line, #1 in our hearts!! carytheone wrote: Ah so Dynastron is the KO Megs to get then? Good to know as there seems to be an itchy rash of them right now. Eventually I'll have the ultimate MP scaled Megatron, but for now a repro'd up leader Megatron will have to do. So far, yes, he seems to be. At least the most extras and stuff. Pretty high quality from what I can see, the details aren't lost like they are on the direct KO copy. He's the one I want! He does look awesome!! I like him more than I thought I would, now I wish my G1 was in better shape!! Most of the stickers turned out great!! I fixed the ones on the hood, they line up nicely now. And I forgot to add two gold ones to bot mode on his pelvis. They are also there. ....ok, now I'm sad I didn't pick-up Autobot Drift when I had the chance. He looks great with those stickers. I have multiple Pretenders that need the Reprolabel Treatment! They really add to the look. bodrock wrote: ....ok, now I'm sad I didn't pick-up Autobot Drift when I had the chance. He looks great with those stickers. He really is a great figure. I think the only thing he lacks as far as posability goes is ankle tilts, and I have no clue on how that could be accomplished otherwise!! Someone would have to re-engineer the whole lower leg like PE did with TR Fortress (and even then they aren't great). The labels don't cover any paint, but there is a set for the eyes which I didn't put on as I ADORE his light-piping!! bodrock wrote: I have multiple Pretenders that need the Reprolabel Treatment! They really add to the look. Oh there's a TON of my G1's that need to be re-labeled. I probably should do that next Christmas if they do their big sale again. Oh man that's unfortunate. I think I have two examples of that, TR voyager Megatron and TR voyager Laser Optimus Prime from the CoV set. And then I have an example of when they sticker them up properly in SDCC TR Fortress Maximus!! It's so hit and miss..
Yeah, they add just enough!! The swords have to be the hardest part. Here's what I ended up with. I did the cool blue and a gold effect on the big sword but left the little guys bare paint. Which works I think. Probably. I think I'm more a fan of his Earth alt mode than his Cybertronian one. I also think the MMC Reformatted version of him is the first Cybertronian alt mode, not his current. Still looks nice!! And here's a DaimChoc/Cheem collabo!! That dang FlameToys one is glorious. I almost don't care that it doesn't convert. And I really like both the GCreation and the MMC, but if I had to choose, GCreation would win for the alt mode. You can see how they almost nailed the original look with the Hasbro figure!! Always light piping > stickers/paint. A good example of repro going overboard. 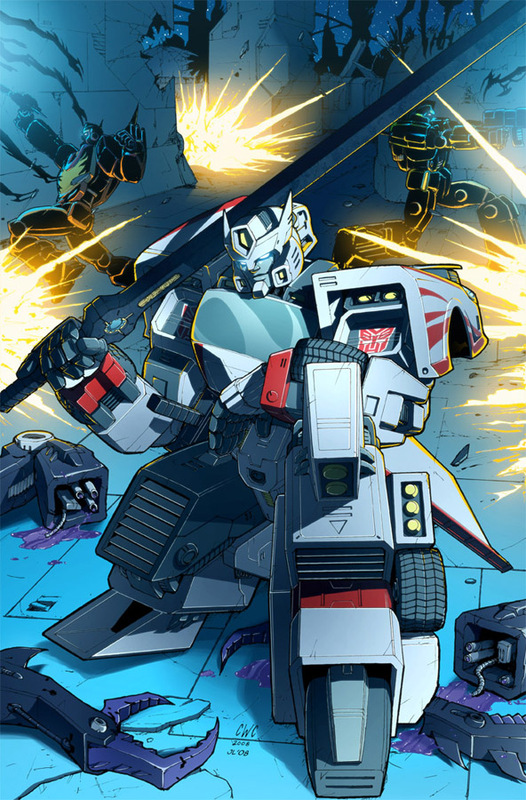 I your restraint on Drift and Prowl. As you probably know, I'm not a big fan of stickers, but if Hasbro has to use them, ship them separately so I can apply them with care. Some of the TR figures have a lot of stickers. Fortunately most of my Stickers Return figures are all pretty well done or the flaws are minimal enough to ignore. Yeah, they add just enough!! The swords have to be the hardest part. Here's what I ended up with. [img]SNIP[/img] I think I'm more a fan of his Earth alt mode than his Cybertronian one. [img]bunch_of_3p_pics_snip[/img] That dang FlameToys one is glorious. I almost don't care that it doesn't convert. And I really like both the GCreation and the MMC, but if I had to choose, GCreation would win for the alt mode. You can see how they almost nailed the original look with the Hasbro figure!! Yes Drift does look more nicer now, not that he was lacking to begin with. I think I like the gen bulky samurai look over his MtMtE Gundam look actually. I'm also leaning on the GCreation figure. It appears to be a larger more refined version of the gen figure. Not going lie to you though, the generations figure is pretty much the best representation of Drift or at least good enough. I'm seriously considering replacing mine with the OS KO. Then he could stand with the MP scale figures. itscramtastic wrote: He really is a great figure. I think the only thing he lacks as far as posability goes is ankle tilts, and I have no clue on how that could be accomplished otherwise!! Someone would have to re-engineer the whole lower leg like PE did with TR Fortress (and even then they aren't great). The labels don't cover any paint, but there is a set for the eyes which I didn't put on as I ADORE his light-piping!! So I just peeled them off. Not better than what is underneath!! itscramtastic wrote: Oh man that's unfortunate. I think I have two examples of that, TR voyager Megatron and TR voyager Laser Optimus Prime from the CoV set. And then I have an example of when they sticker them up properly in SDCC TR Fortress Maximus!! It's so hit and miss.. It would be nice if they were on a separate sheet, like they did with the "Asia Exclusive" ones they shipped with multiple bots on one sheet. Those are the ones you have on CW Devastator, right? Yeah, they add just enough!! The swords have to be the hardest part. Here's what I ended up with. I think I'm more a fan of his Earth alt mode than his Cybertronian one. [img]bunch_of_3p_pics_snip[/img] That dang FlameToys one is glorious. I almost don't care that it doesn't convert. And I really like both the GCreation and the MMC, but if I had to choose, GCreation would win for the alt mode. You can see how they almost nailed the original look with the Hasbro figure!! Although I really want that GCreations one. I may have to figure something out! itscramtastic wrote: It would be nice if they were on a separate sheet, like they did with the "Asia Exclusive" ones they shipped with multiple bots on one sheet. Those are the ones you have on CW Devastator, right? I believe the sheet was the Asia exclusive sheet. It's official and just for Devy and pals. Crap, I keep forgetting that. Yeah, other than that glaring issue he's awesome. I wouldn't mind one for painting instead of labeling!! Or I can just put that money and time toward GCreation Ronin. OR FLAMETOYS!!!!! So many cool versions of Drift! I will need to complement my collection with an Autobot version sooner or later, and seeing all the ones you listed, they all look pretty cool....I would also want him to have large sword storage though. bodrock wrote: I would also want him to have large sword storage though. Ah, but you can store the sword on the back. Some people's version was missing the clip. Well hey look at that!! BUY HIMMMMMMMM!!! itscramtastic wrote: Well hey look at that!! BUY HIMMMMMMMM!!! I looked at some feedback pics over at Ali and they show the sword clipped on the back as well. 4,119 pages were recently viewed by 666 unique visitors. This page was viewed 1 times on Wednesday, April 24th 2019 12:49pm CDT. © 2019 Seibertron, Inc. DBA Seibertron.com. All Rights Reserved. Established June 2000. Seibertron.com is owned by Ryan Yzquierdo.